TLDR: 4 out of 5 for a well-told tale holding a thoughtful mirror to society. This book came with the Brilliance Audio Adventure collection that I purchased from Audible earlier this year. 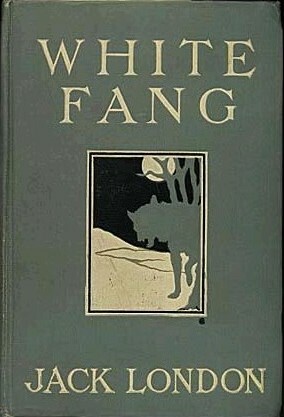 White Fang comes with four other classic novels (Treasure Island, Gulliver's Travels, The Jungle Book, and The Merry Adventures of Robin Hood), read by well-respected readers like Simon Vance. White Fang is about a wild, half-wolf / half-dog, that is captured and raised as a sled dog in the Yukon and Northwest Territories of Canada and must adapt to living with humans under various circumstances. It's in some ways a companion novel and a mirror to London's Call of the Wild which is about a domestic dog that adapts to the wild. I found the novel to be very reminiscent of Anna Sewell's Black Beauty (about a horse with various masters), if you've read that. White Fang holds several jobs over his career. London once wrote that both of his books about dogs were a reaction to other novels he had read which humanize animals, attributing human-like thoughts to them. London wanted to tell these stories from the dog's perspective - making it clear that dogs weren't people. I can't say that I really found this worked - late in the novel, we meet a human criminal and are given a synopsis of how he came to be the man he was - and it pretty much parallel's White Fang's early life, which rather strongly humanizes the dog, in my opinion. White fang is a plain and naturalistic story, but it does bring some interesting questions to light. Can humans be made bestial and animals made human depending on how we nurture them? Is change in human hearts and human society possible without violence? Are society and the individual at odds with one another? This is one of those books I feel is better as an audio experience. The large majority of the story is told from the dog's perspective, and there's no dialogue. I find the reading of such books to be daunting - I like to have books broken up by dialogue, and when I don't see that I shy away. But in an audio presentation one can't be put off by that. The whole book feels like a conversation, and it actually does flow quite comfortably and is easy to follow. I rather enjoyed it, for this reason. I'm not sure there's much to be taken from this story for gaming - except from the very beginning, which is quite brilliant and suspenseful, I thought - two men are taking the body of a British aristocrat to burial by dog sled. As they cross the snowy country of the Mackenzie valley, they notice first that they have one too many dogs - and then their dogs start to go missing, one at a time. I won't spoil what happens next, but I loved the adventure potential inherent in transporting that much meat across a winter-starved landscape. Recommended for when you need a break from the usual gamer fare. 4 out of 5.